Now that the summer is here it is important to keep your kids reading books at all times. The following are tips to keep your kids reading during their summer break. Go to your local library and get a reading list of books to read over the summer. Enroll your children in storytelling time, youth clubs and/or book clubs. The libraries have lots of educational activities for the children. Make sure to get a library card for your child and have them pick and check out their own books! 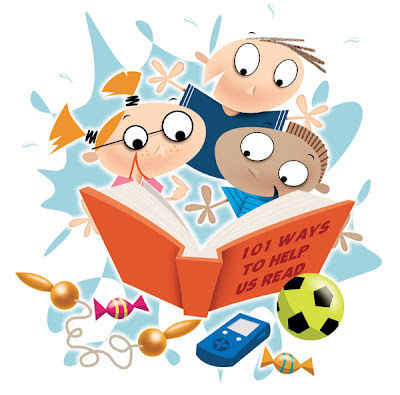 Look for garage sales and give your child a dollar so that they can buy their own book! Swap books with friends and family so that they will have different books to read. Record yourself reading a book to your child and make sure to read with emphasis and character. Then have them replay your recording with the book in their hands another day. This will sure get them to sit down and listen to the story on their own. You can also record your child reading a book and replay it when they have become better readers so that they can listen to themselves improve. Help your child make his or her own storybook. Make funny drawings, or glue photos of family members onto construction paper. Let them get creative with the colors and photos. You can then can staple it on the sides and punch holes and put either yarn or ribbon to make it look nice. Purchase a personalized book with their name and/or photo in the storyline. This will sure be a big hit with the kids and will interest them in reading it every day!